We are so proud to announce that for the 8th year in a row Chestnut Family Dental’s very own Dr. DeLeo and Dr. Mercado have been named Top Dentists in NH Magazine. Please join us in congratulating your favorite Manchester, NH Dentists on this acknowledgement! Gold standard in dental care through current and ever-advancing knowledge of dentistry. State-of-the-art office equipment allows us to efficiently and comfortably provide beautiful smiles. Community service and “giving back” are important priorities for our team. We improve and maintain patient’s’ overall dental health and happiness throughout their lifetime. We strive to accommodate patients with any special need and treat each patient with respect and acceptance. Highest-level clinical quality of care provided with traditional New England style and charm. Visit Manchester, New Hampshire’s Top Dentists Today! If you have any questions about the services we provide at Chestnut Family Dental please do not hesitate to contact our Manchester, NH office. 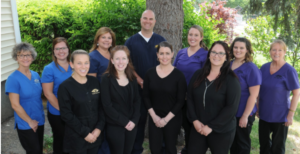 We look forward to welcoming you into our dental family!